Prior to his trip to France Prince Danilo assigned in a testament his nephew Nicholas (Nikola) Petrovic, the son of Duke Mirko, to be his successor. Nicholas was sent to France in 1858 for an intensive education. 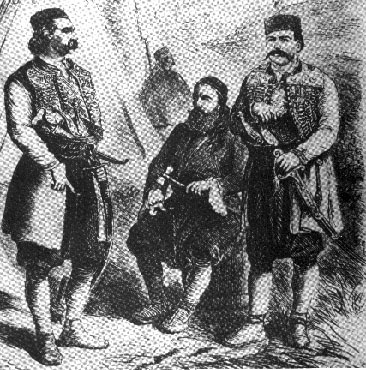 Following the Danilo's assassination (1860) young Nicholas returned to Montenegro to find his father, Duke Mirko, maintaining the complete grip on power. Duke Mirko had the Senate under his control and a good family relations with several of the most influential Montenegrin tribes. During the entire reign of Nicholas, his family ties in Montenegro, as well as abroad, were an important political asset. When Nicholas was eight, Duke Mirko arranged his engagement to the doughtier (Milena) of an influential member of the Senate, Petar Vukotic from Cevo (Katunska nahija). The family ties with the Vukotic family were very useful to the new Prince and future King Nicholas. Similarly, Prince Nicholas' six out of nine daughters were married to royal or aristocratic families of Europe. At the very beginning of Nicholas reign, Montenegro was bracing itself for Turkish attack. Irritated with the Montenegrin support of Herzegovian rebels and constant attacks on Turkish posts along the border, culminated with an ultimatum by Omer Pasha Latas to Prince Nicholas to stop these practices. Since Nicholas refused to accept the Porta's terms "unless the Porta fulfills justifiable demands of Herzegovian and Montenegrin rebels", Omer Pasha Latas attacked Montenegro on 22.05.1862. The Turkish plan was a carbon copy of the one from 1853: to occupy Montenegro and capture Cetinje. Being in a very difficult situation, Prince Nicholas and Duke Mirko asked for help from Serbia. Serbian government promised the help but could not deliver it in time, so that Montenegrins were left to rely on themselves to defend their country. The first Turkish attack was rebuffed by the Montenegrin victory near Novo Selo. Soon after the Turkish forces penetrated the Montenegrin defense lines and were approaching Cetinje. However, upon the French and Russian intervention, Turkey was forced to sign a peace treaty with Montenegro (September 1862). The second Omer Pasha Latas' attack on Montenegro, and the decisive and heroic stance of Montenegrins, enhanced further the reputation of Montenegro in the eyes of the Great Powers making it clear that Montenegrins will not accept anything that limits their independence and sovereignty. Following this Turkish attack, the Serbian government led by Prince Milos Obrenovic which was supporting Montenegro although not actively, forged an agreement with Prince Nicholas about mutual co-operation in the fight against the Turks (1866). Duke Mirko was unhappy with the agreement and he wanted a military pact with Serbia in order to attack and defeat the Turks rather than wait and defend. Four years later (03.09.1870) Prince Nicholas in the Senate openly expressed his doubts about sincerity of the Serbian Government intentions about military co-operation. During the uprising in Boka against Austrian rule (1870), Prince Nicholas, although formally neutral, helped rebels from Boka in their rebellion against Austrian rule. 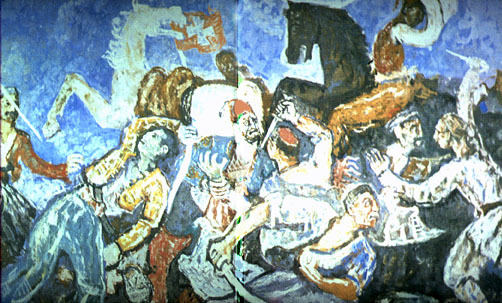 In the 'Boka' (Bokeljski)' or 'Krivosije' uprising the people of Boka defeated Austrians forces repeatedly, forcing them to sign a humiliated peace terms. Similarly, in the middle of 1870s, Prince Nicholas was actively helping Herzegovian rebels in the organization of the uprising against Turkish rule, despite the protests of Turkey and other Big Powers. Co-ordinator and organizer of the uprising were, Nicholas' father in law Duke Petar Vukotic and Duke Peko Pavlov Nikolic (later known as Peko Pavlovic), both from Cevo. A year later (1876), the rebel leaders met in Grahovo and proclaimed Prince Nicholas of Montenegro as the Prince of Herzegovina and asked him to be their ruler. Prince Nicholas accepted the offer providing that the Great Powers agreed. Since Herzegovian uprising could not be localized, Montenegro and Serbia agreed to declare a war to Turkey on 18.06.1876. 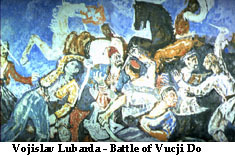 In the well planed and bravely fought war Montenegrins, allied with Herzegovians, came out victoriously from the six major battles (Vucji Do, Fundina, Medun, Trijebca, near Spuz, and Doljani) and 27 smaller battles. The most crucial was the battle of Vucji Do (18.07.1976) where Montenegrins heavily defeated Muktar Pasha's forces and captured and killed Osman Pasha and Selim Pasha. In addition, they captured a large consignment of weapon and ammunition. At the end of the first phase of the war, according to the reports of the Montenegrin high command, the Turkish losses were 17 000 killed, 18 000 wounded, and 1 150 captured. The Montenegrin losses were as low as 700 killed and 1.300 wounded (Jagos Jovanovic, Stvaranje Crnogorske drzave i razvoj Crnogorske nacionalnosti, 1947, Obod-Cetinje, p. 316)!. This tenacity was not lost on the world; Alfred Lord Tennyson praised the "race of mightier mountaineers" in his 1877 poem "Montenegro", published on the front page of the Nineteenth Century. The poem was accompanied by a long essay on Montenegrin history by British PM Gladstone, who encouraged Tennyson in the role of 'Montenegro's Bayron'. Earlier that month, in a speeach to the commons, Gladstone had eulogised the Montenegrins as "a bunch of heroes such as the word has rarely seen". In the second phase of the war (1877) Montenegrins fought heavy battles along the borders of Herzegovina and Albania. Prince Nicholas took the initiative and counterattacked the Turkish forces that were coming from the North, South and the West. He conquered Niksic (24.09.1877), Bar (10.01.1878), Ulcinj (20.01.1878), Grmozur (26.01.1878), and Vranjina and Lesendra (30.01.1878)(Jagos Jovanovic, ibid p. 320). In the same year (1878) the advancement of Russian forces toward Turkey was brought to an end by the peace of San Stefano (19.02.1878). According to San Stefano's treaty, Turkey was to hand over to Russia Kars, Batum and Avdagan, and to recognize the independence of Romania, Serbia, and Montenegro and sovereignty of Bulgaria. According to the treaty the territory of Montenegro was to be enlarged from 4.405 km2 to 15.355 km2 (Jovanovic, ibid, p.320). On the insistence of England and Germany, San Stefano treaty was revised in the Summer of 1878 on the Berlin Congress. Serbia and Montenegro were finally recognized as independent states. However territory of Montenegro was less twice as much (8.655 km2) than it was agreed by the San Stefano treaty. The most difficult part for Montenegrins was the protocol X of the article 29, according to which Austro-Ungary had the right of police control over the port of Bar (Jagos Jovanovic, Stvaranje Crnogorske drzave i razvoj Crnogorske nacionalnosti, 1947, Obod-Cetinje, p. 223). Turkey tried to postpone the hand over of Montenegrin territories but eventually did so at the end of 1780. The demarcation of the borders was done in 1883 by mutual agreement, although the role of English PM Gladstone was significant. After the liberation's wars (1875-1878) the centuries long fight for freedom and independence was finally rewarded on the Berlin Congress. This international recognition meant that Montenegro needed not to be the large war camp any longer, but needed to develop the institutions of the modern state instead. The prospect of the social and economic development was improved rapidly by the regaining of the Montenegrin towns from the Turkish control. Following the Berlin Congress, Prince Nicholas abolished the Senate replacing it with the State Counsel, Ministries, and the High Court (1979). He reorganized the education system opening many schools across Montenegro. The new administration needed literate and educated people. The publishing activities revived in Montenegro with Prince Nicholas acting as a protégé of art and poetry (see Literature). In 1888 the famous lawyer Valtazar Bogisic wrote the new Common Law which replaced the 'General Law of the Land' of Prince Danilo used since 1855. Introduction of High Court signified the separation of state judicial function from the executive one. Prince Nicholas also introduced the Property Law (Imovinski zakonik) with precise definitions of property rights and obligations (1888). Until the judicial reforms in 1902, appeals against court ruling could be filled to Prince Nicholas who had the last word. That practice continued even after the judicial reforms but the Prince consulted the High Court and sometimes referred the issues back to the High Court. On the St. Nicholas Day Assembly (Nikoljdan) 19.12.1905, Prince Nicholas introduced the Montenegro's first formal Constitution. According to the new Constitution, Montenegro was a constitutional but not a parliamentary monarchy. The introduction of the constitution and additional laws, as the Freedom of Press Law and the Criminal Law, paved the way for a modern legal framework in accordance with the standards of the Western European countries. In order to improve the commerce and trade Prince Nicholas organized the building of the new roads and railway across Montenegro. The roads were mostly build by the unpaid forced labour (kuluk), and by the labours who worked for the grain which originated from the Russian aid to Montenegro. The unification of all the parts of Montenegro in a single unity was helped by the introduction of the postal, telegraphic and telephonic traffic. Sail on the Skadar Lake. However, the investor did not stick to the details of the agreement at the expense of Montenegro. In 1910, the parliament proclaimed Montenegro a constitutional monarchy with Nicholas as King (Nicholas I). Even though he became a king, the authority of Nicholas was diminishing. Financially strong individuals start emerging in Montenegrin towns and saw Nicholas autocracy as an impediment to their progress. Similarly, a number of Montenegrins who returned from Western countries, where they worked and experienced democratic freedoms, were not happy with the King's autocratic rule. In addition, from the 1880s a significant number of pupils and students have gone to study in Serbia. In Serbia they were heavily influenced by the ideas of the governing Serbian nationalistic bourgeoisie, which since the time of Prince Milos, were expressing tendencies for annexation of Montenegro. On their return home, the students were preaching the Serbian ideas in the same way they had been told in the parties' clubs of Obrenovics' Serbia. In any case it was evident that Nicholas stared losing a touch with people when he came in conflict with the most respected Montenegrin heads (Marko Miljanov, Jole Piletic, Peko Pavlovic, Djoko Pejovic and others). In the years prior to WW1 and thereafter, the internal affairs in Montenegro were heavily influenced by the division between the representatives of 'people movement' and those of the Government and official views. In the political arena, the main political parties were 'People Party' (Narodna Stranka) led by Sako Petrovic, better known as 'Klubasi' and 'The True People Party' (Prava Narodna Stranka) known as 'Pravasi' led by Lazar Mijuskovic. Klubasi were the first parliamentary and democratic party in Montenegro. Their political credo was the unification of Serbia and Montenegro and dethronisation of the 'non-people' king. The methods of their political activities were as ruthless as the Nicholas' treatment of their activists. In the dynastic fight for prestige and the Serbian throne between Petrovic and Obrenovic dynasties, King Nicholas had an advantage before the rise to power of Radical Party in Serbia. The Radical Party justified its name by radically departing from the policies they preached prior to coming to power. Following the rise to power, Radicals start expressing their aspiration for Greater Serbia. Pursuing its own interests, Russia instructed its most loyal ally in the Balkans to make a pact and military convention with other Balkan states. King Nicholas and his government made the Balkan Pact with Bulgaria, Greece, and Serbia during 1912. In the forthcoming Balkan Wars, Turkey suffered humiliated defeat, despite the support from Austro-Ungary, and was pushed back toward Asia. Montenegrins thought that they came out as a main victors from the both Balkan Wars despite the heavy casualties they suffered. However, the costly capture of Albanian town Shkoder (Skadar) was futile since Nicholas I was put under pressure by the Great Powers to hand it over to the international supervision. But the worse was still to come. Just before the beginning of the WW1, King Nicholas signed 'Plan for (military) operations' with the Serbian Government, hoping to achieve more co-operation between the people of Serbia and Montenegro. He made a fatal mistake by allowing the Serbian authorities to send their own officers to be commanders of the Montenegrin Army, amid dynastic struggle for supremacy. Predictably, acting on the advice of the Serbian dynasty Karadjordjevics, the Serbian commanders of Montenegrin war operations led Montenegrin Army not to serve the interest of Montenegro but the interest of Serbian dynasty. Out of total of the 45.000 Montenegrin forces in the WW1, two-thirds were stationed towards Bosnia, and one third towards Albania by the Serbian General Jankovic. King Nicholas strongly disagreed with these 'tactics' and later ordered his army to conquer Skadar without consultations with Jankovic. General Jankovic resigned his post in protest, accusing King Nicholas for co-operation with Austria. He was replaced with Colonel Pesic who pursued similar policies if not more sophisticated. Due to the Colonel Pesic's tactics, Austrian forces captured Lovcen's peaks Kuk and Krstac (29.12.1915), leaving Montenegrin forces in an extremely difficult situation. At the same time, Montenegrin forces on the Sandzak front fought ferociously and heroically for every single position in order to insure the retreat of Serbian forces to Albania. The glorious battles were fought at Glasinac, Kalinovik, Klobuk, Foca, and finally at Mojkovac. In the famous battle of Mojkovac the Montenegrin forces inflicted heavy casualties on Austrian forces and stopped their advancement giving enough time to the Serbian forces to retreat through Montenegro to Albania. Austria occupied Montenegro in 1915, when Serb-led forces protecting the region fled to Greece via Albania. The Allies quickly declared their solidarity with the defeated Montenegro. British Prime Minister David Lloyd George promised, "The Allies will do justice to the heroism of the Montenegrins." The Allies did win the war, but Montenegro did not regain sovereignty. When Austria retreated in defeat in 1918, Serbia moved in, purportedly to secure Montenegro's stability for a transitional period. Following Austrian advance, King Nicholas decided to flee Montenegro. He exiled to France and never was able to return to Montenegro. His departure and the subsequent declaration for unification of Serbia and Montenegro (1918)led to an end of Montenegro as an independent country and kingdom. King Nicholas died in Italy in 1923. His remains, and those of his wife Milena and three daughters, were moved to Montenegro's old capital, Cetinje, to the Chapel of Cipur in 1989.